Kay's Cookery, where cooking is all about learning to expand your cooking skills to encompass a world of herbs, spices and techniques. Kay's Cookery was set up by Kalwant Sahota after she came back from her journey across India with TV Chef Gary Rhodes for his programme Rhodes Across India. While in India, she increased her already extensive background of Indian Cooking, being taught by local experts from each region. At Kay's Cookery you can learn to cook international cuisine, such as Thai, baking and specialised menus for those with food allergies, for example wheat free, and of course Indian cooking. Kay's Cookery is based on a philosophy of taking fabulous authentic Indian / Asian / British dishes and converting them into modern, healthy versions, so that you can enjoy them on a daily basis. If you need confidence to enjoy cooking or you want to change the way you cook to be healthier, then Kay's Cookery is for you. 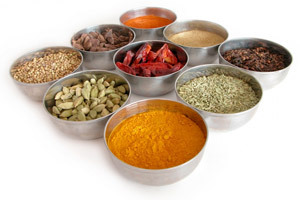 Perhaps you are a food lover looking for inspiration, try Kay's advanced course, which shares the regional Indian cooking techniques. Kay's Cookery classes are 'hands on' so you won't be taking a back seat. With everything provided, there is no need to worry about writing down recipes, leaving you free to relax with a drink and meet others on the course. You will be given a short talk about the recipes so that you can begin to understand the key elements. Each step is demonstrated and then everyone has a go! Feel free to ask for extra support, or to discuss a particular ingredient. We watch everyone's progress and offer a little help or more help where needed. While we want everyone to do well, the whole class is very relaxed as this helps you to learn. Feel inspired, be creative, you can do it! So book a course today and be introduced to imaginative cooking on one of our courses.